Against the background of performance optimisation, there is ever greater recognition of surface area as a valuable resource in all industrial sectors. Every square metre that cannot be used productively is a cost factor. For this reason, compact designs are increasingly sought after, even for machines. 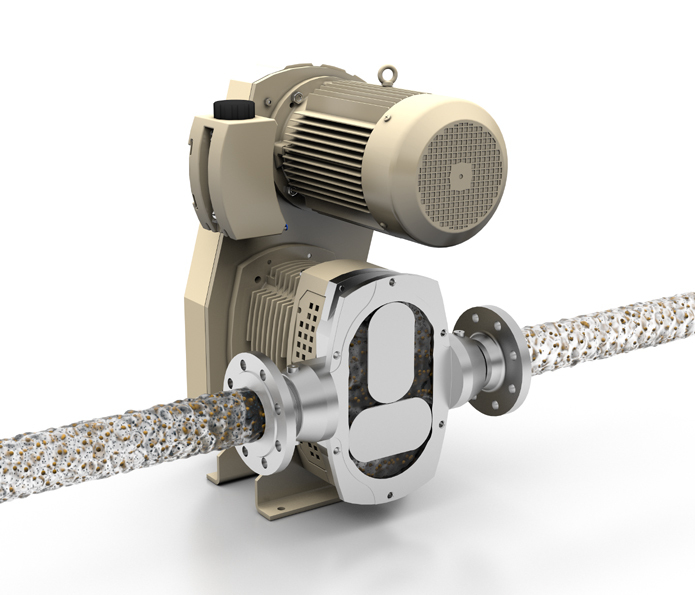 Netzsch has therefore now developed a smaller version of its proven T.Sano rotary lobe pump for processes in which smaller volumetric flows suffice. The all-metal pump, which is specially designed for media that are demanding in chemical or hygiene terms, offers a pumping capacity of up to 8m³/h and in doing so requires less than half the space in comparison to the largest models in the series. The example of an Italian personal hygiene product manufacturer shows what is possible with this pump: the company has set the compact pump up on a trolley to enable mobile use. This means a saving in terms of additional technology as well as space. The company is based in Northern Italy and its products include soaps and shampoos for various markets. The basic materials for this have to be conveyed from tanks to the manufacturing lines at 2 bar with a flow rate of between 1 and 6m³/h. However, the existing pumps needed so much space in the narrow passage that accommodates the connections that this not only impeded the installation itself but also any maintenance or cleaning work. The company therefore switched to a T.Sano 08/8 from Netzsch’s Tornado T2 series. Due to their design, models of this type already need considerably less space than some comparable pumps, without sacrificing anything in terms of performance. The reason for this is the belt drive, which both drives the rotary lobes and ensures their synchronisation. Thanks to this dual function, no complex gearbox is needed, and in addition the motor can be placed directly above the conveying chamber - which means there is an extremely small installation depth. In the new smaller 08/8 version, which was created for applications where the priority is not high conveying volumes, the basic dimensions for width, depth and height only come to 305 x 346 x 630mm. For the soap manufacturer, whose previous pumps were over 1m long, that has meant a noticeable improvement in terms of the confined space. In addition, the belt drive runs very smoothly, which reduces wear, and it operates completely oil-free, with the result that there is no longer any need for lubrication work. The choice of materials also makes a contribution here: the T.Sano only uses stainless steel or other special steels for the housing and rotary lobes. The hard-wearing materials ensure a long service life and guarantee the pump’s long-term availability. Furthermore, both being oil-free and having a stainless steel design ensure complete hygiene in the manufacturing process – a small pump with great powers of persuasion. Roger Willis is with Netzsch.